Every Spring, the town of El Puerto de Santa Maria, blooms into bursts of colour. El Puerto de Santa Maria began its Fiesta de Los Patios around the year 2000. 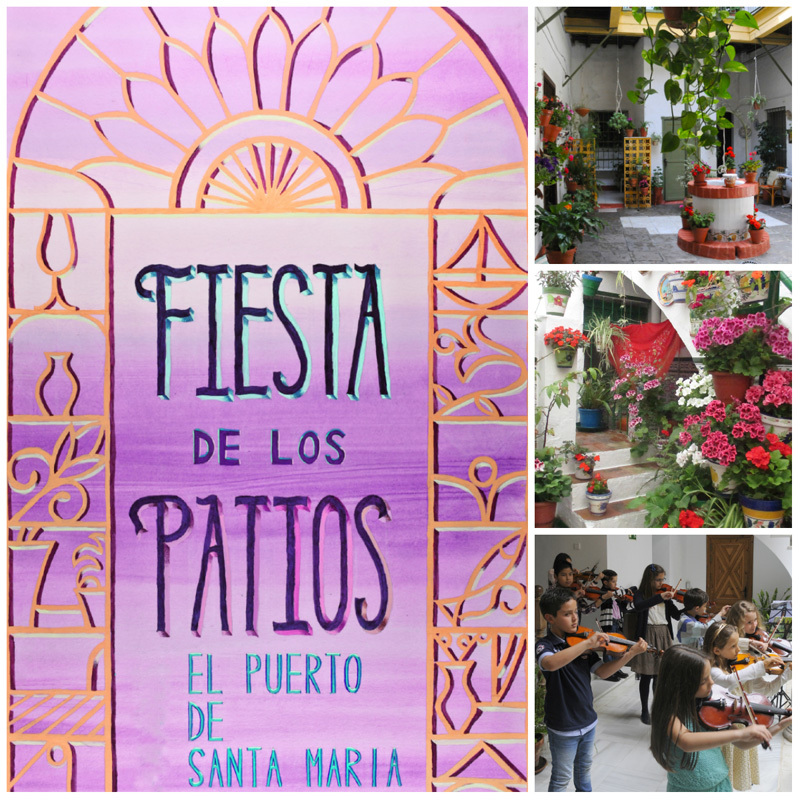 The "Association of Friends of the Patios of El Puerto de Santa Maria" (Asociación de los Amigos de los Patios Portuenses) sponsors a type of "open-house" that allows everyone to visit selected patios in the historic part of El Puerto. To understand why a celebration of this type was created, it is important to know a little about Andalusian architecture. 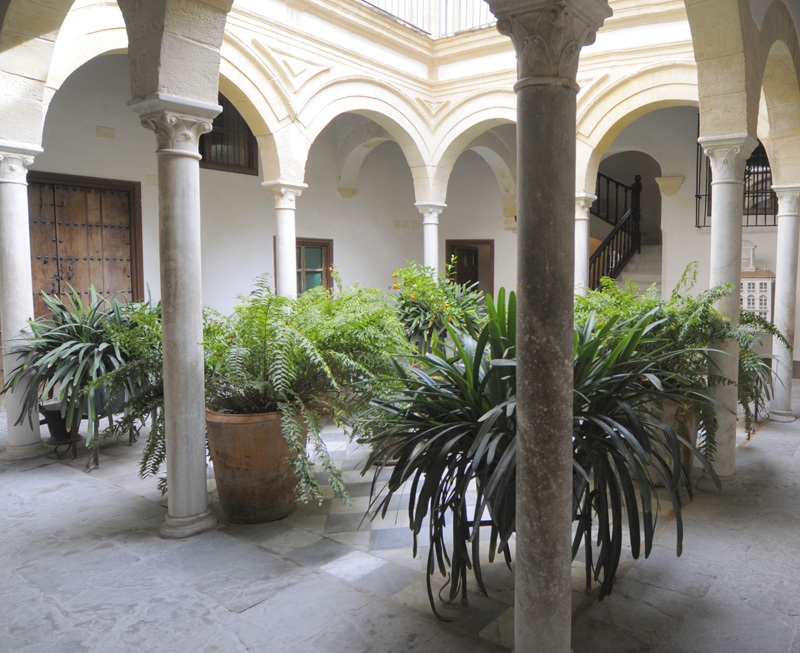 Due to the summer heat, Andalusian homes have always been built with a central patio. This is a tradition that dates back to the Roman era and was a common architectural feature. Filling this central patio with plants and water-features has always been a way to keep these homes cool. 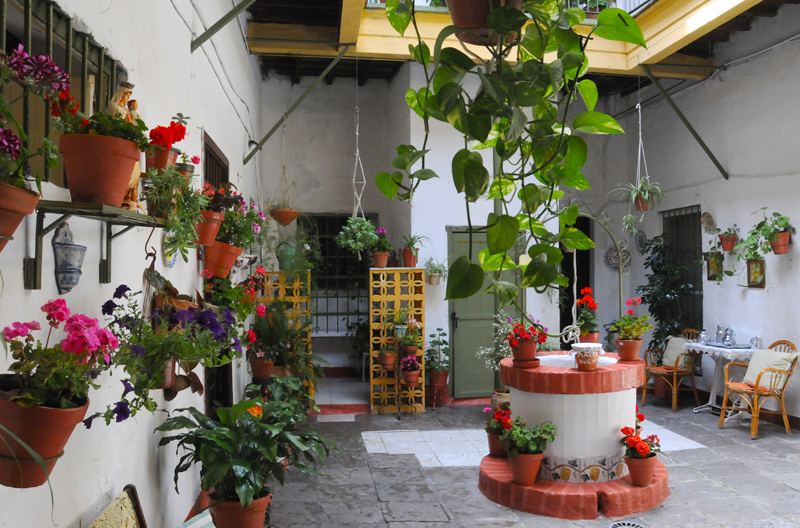 As the main focal point of a person´s home, these patios not only offered a visual feast of colorful flowers, stone mosaics, and ceramic decoration, but they also brought out the classic scents of the Andalusian Springtime: jasmine and orange blossoms mixed with a myriad of scents from many other flowers and plants. Providing a refuge from the summer´s heat, they were often the perfect location for enjoying its gardens and fountains, serving as a common area for family parties and dinners. Many of these patios are found behind unsuspecting doorways and are part of palace-like homes, or even monasteries, that were built long ago by what are referred to as "Cargadores de Indias" (Indies Transport Companies). It is a curious name, but it is one that has strong ties to America and the rest of the "New World." Since Columbus was convinced that he had landed in the Orient, the lands that he discovered were always referred to as the "Indies." The "cargadores" were those persons who created transport and supply companies to serve the industries that grew out of the colonization of the Americas. These merchants became apt traders of goods between both the Old and New worlds, from which they acquired small fortunes. These homes can be found throughout the area in which we live (especially in El Puerto, Cadiz, and Sanlucar) since the usual ports of departure were in Southern Andalusia. El Puerto de Santa Maria eventually became known as the "City of 100 Palaces." The palace located at Calle Javier de Burgos, number 10, has been home to Brigette Dwyer and CDR Matt Hannon, MC, USN, for the past two years. It is a stone´s throw from the Guadalete River, which runs alongside the old town of El Puerto. There is no doubt that this home, built in 1680, was utilized by one of the shipping merchants doing business in the Americas. The patio has beautiful plants and original marble columns that were hewn by the hands of skilled stone masons. It belongs to Don Jorge Minisque. The palace located at Calle Virgen de los Milagros, number 5, has been home to Stephanie Rico and CAPT Todd Peterson, MC, USN (Retired), for five years. It was built in 1773 by the family of an Irishman born in Cadiz, Thomas Patrick Ryan. His family had previously escaped the confiscation of property occurring in England during that era. The home eventually became known locally as "El Palacio O'Rian," with a purposeful misspelling to facilitate its pronunciation in Spanish. The property has since passed through the hands of several winery-related families, and is now known as "El Palacio Terry." 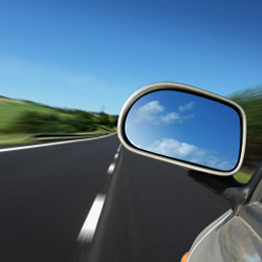 The present owner is Don Tomas Terry, who also traces his family back to Ireland. Asociación de los Amigos de los Patios Portuenses has catalogued approximately six hundred patios in El Puerto. Some of them are part of historical buildings, convents, communal homes, or palaces. About 25 patios are part of the patio festival. They are all beautiful reminders of the past which the 'amigos' wants to preserve, protect, and share with others. There is no set route, nor order, which needs to be followed. You can visit them all, or just a few. Park in the car park that is next to the El Puerto bullring, or in the parking near the Catamaran boarding dock, and visit the different patios on foot. Most of the participating patios will be marked with a colorful apron hanging above the doorway. 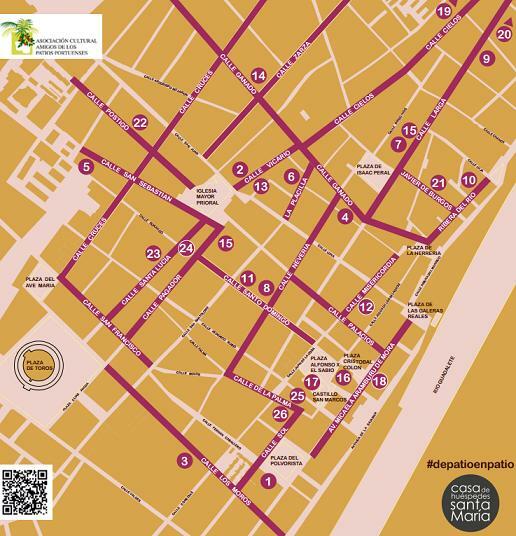 Download a PDF brochure (Spanish) for the 2016 Patios festival which includes a map and a list of associated cultural activities. The Amigos have a facebook page and a website.